Before you create a canned response, you first need to enable the Canned Reponse labs feature. Begin by clicking the Settings link in the upper right corner of the screen then clicking on the Labs tab. Scroll down until you see the labs feature “Canned Responses”. Click Enable to the right of the description, then scroll to the bottom of the screen and click Save Changes. To create a new canned response, click Compose Mail on the left to create a new message. Type in the subject and body text of your message.Â Just under the Subject text box, you will see a link labeled “Canned Responses”. The first time you click it, the only option will be to Save a new canned response. Click on the option “New canned response” and a pop up window appears and prompts you for a friendly name. In my example, I’ll use “Weekly Reports” as the name and click “OK”. You’ve just created your first canned response. 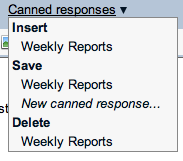 To use it in the future on a new message or reply, just click the Canned Response link and choose Insert> Weekly Reports. You can create new canned responses at any time by composing a message, then saving that message as a canned response. Two bits of information worth sharing, first the canned response only takes the message body as the canned response. The subject, recipients, and other fields are not part of the canned response. It also takes the entire message in the message body window. If you have a signature line in the canned response and you have signatures automatically inserted, you will see two signatures. If your canned response is not exactly as you wish, you can insert it, make the necessary changes, then click the link again and choose Save> Weekly Reports, for example, to update that particular canned response. If you no longer need a canned response, click the Canned Response link and choose the appropriate name under the Delete grouping. Canned responses are a quick and easy way to save time if you are sending a routine message in Gmail. Quick Tip: Enable the Google Maps Previews in mail labs feature to have Gmail automatically display a map when someone includes an address in an email. This saves you time for copying the address from a mail message, opening another window then pasting the address in to Google maps. Additionally, if you post a Google maps link in to a Buzz message, Buzz will automatically include a preview image. If you like photo, docs, and other previews, then you’ll want to be sure to add the maps preview labs feature to your collection. Just click on the settings link in the upper right corner, choose the labs tab, and scroll down until you see the labs feature “Google Maps Previews in Mail”. Click Enable, scroll to the bottom, click Save Changes and you’ll get a maps preview when someone sends you a street address. Sponsored by GotoAssist Express. Try it free for 30 days. This is probably one of the shortest Gmail Podcasts to let you know that the drag and drop feature that was announced for file attachments in April 2010 is now also available for images in the body of your message. To use it, start composing a new message. 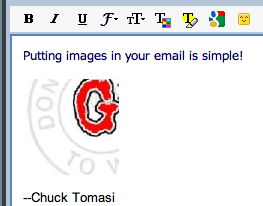 Then simply use your mouse to click on a JPEG, GIF, or PNG file and drop it on the body of your message. Once the image is uploaded, several links appear under the image that let you size it to small, medium, large, or original. That’s it. Currently this feature is only available for Chrome. However, combined with the drag and drop file attachments, I’m starting to use Chrome as my primary web browser over Firefox. Although, I’m sure the feature race between these two browsers isn’t over yet. Keep listening to the Gmail Podcast and watching the blog for updated information. Here’s a tip how to track if your email address is being circulated and stay organized using Gmail. This past week I was out having dinner on a business trip. The hostess approached the table and asked if we would like to be emailed promotional information for their establishment. Since the restaurant chain and a place nearby where I live, I agreed; all they needed was my email address. I don’t know about you, but every time I give out my email address, I get uneasy about the trust that the company I give it to won’t be selling it to someone else. While I can’t solve the trust issue, I can determine if they give the address away. Here’s what I did. I added a “+” and a keyword to the first part of my address. For example, john.doe+joesdeli@gmail.com if I went dining at Joe’s Deli. Now I can filter on any email that has a “+” in the to address and star it, label it, or flag it someway to determine where it came from. Listen to some of the earlier Gmail Podcast episodes for information on filtering and labeling to determine how to automatically assist in visual identification of these messages. With luck, I will only see messages with the “+joesdeli” suffix from Joe’s Deli. If I start to see that address appear somewhere else, I will be less trustful of Joe in the future. One word of caution, you may not be able to use this trick on web forms. Many websites don’t allow the “+” symbol in an email address. They think it’s an invalid character, so you may not be able to use this trick everywhere. Since I wrote it on paper at Joe’s Deli, I’ll let that be their problem since my email address has a higher value to them than me getting their promotional mail at this point. When you think of drafts in Gmail, you probably think of the auto-save feature that comes along periodically, or the fact that you can save your draft and come back to it later to complete and send. Those are terrific features and I’d like to add a couple more neat ways to use drafts to be more effective with Gmail. The first way is to use drafts to save notes. This idea was originally conceived before the introduction of Gmail tasks. While not as elegant and organized as Tasks, it can be used in a different way. The basic idea is to start composing your notes in a mail message, and save it as a draft. One idea is to save multiple copies, let’s say one for work ideas, one for home ideas, one for special projects, and so on. With the rich text formatting, Gmail makes a pretty nice note taking system, especially when you factor in Gmail’s search capability also looks in the Drafts folder. The second neat way you can use drafts is for temporary file storage – even beyond the 20 MB limit! Let’s say you want to copy a file from one machine to another, but you don’t have a thumb drive, or an account with a file sharing service like DropBox. Begin by composing a message, attach a file of nearly any size, then click Save Now to save it as a draft. Login to another computer, login to your Gmail account, go to the Drafts folder, and click on your file attachment or right-click and select Save link as… to download your file to the second machine. When you are done with that draft, you can click Discard to have it removed completely. Remember, drafts can be used for more than just a handy way to restore your work if your connection is interrupted. You can keep organized notes and file transfers using the same standard Drafts features. Welcome to part 2 of our 3 part series on texting from Gmail and Google applications. If you haven’t listened to part 1, you can download it from iTunes or listen directly from the Gmail Podcast blog at chuckchat.com. • Publish a single phone number and have it ring your home, work, and mobile phone or any combination based on the caller. Begin by signing in to Google Voice using your Gmail account at voice.google.com. At the top, just under the logo, click the SMS button. Begin typing the name of the contact or their phone number. Make sure you have mobile phone numbers associated with the contacts you intend to send text messages. Unlike the Gmail Chat feature, it will not prompt you for the contact if you enter only the number. Similarly, if you enter a name that has no mobile phone number associated in your contacts list, you cannot send a message. After you have entered a phone number or contact, type your message and press send. It’s that simple. Managing your Google Voice conversations from the web interface is very similar to Gmail. Responses will show up in your Inbox or you can look at just SMS messages and filter out voice mail by clicking the SMS link on the left. You can reply by typing in the text area just under the conversation and click Send. Currently, Google Voice is free and open by invitation only. Contact me if you are interested in trying it out. This episode is sponsored by GotoAssist Express. Try it free for 30 days. Google offers a number of ways to send and receive text messages for free without using a mobile phone. This is part 1 of a 3 part series on using text messages, or SMS, with Gmail and other Google applications. Let’s begin with Gmail. Texting from Gmail chat is fairly easy. To do this you will need to enable the Labs feature “Text (SMS) in Chat”. You can find this in the Labs tab in the Settings page. Once the labs feature is setup, begin by opening the chat window and signing in to chat. Type the name or phone number of the person you want to send a text message to in the “Search, add, or invite” box. If this person is not already in your contacts list, don’t worry. 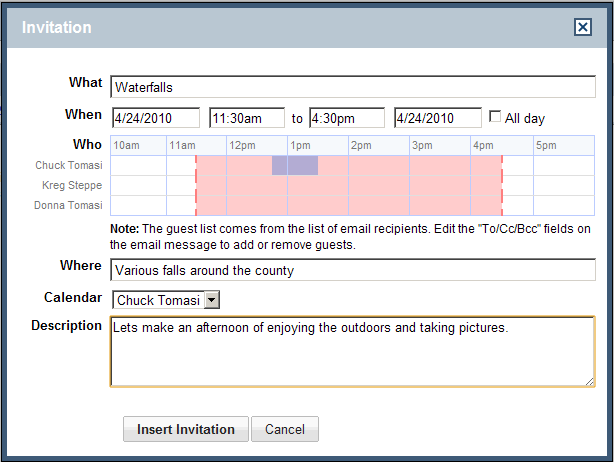 As you type, a window appears under your text with options “Mail, Invite to Chat, and SMS”. If you entered a phone number, only the SMS option will be displayed. Finish entering the text then choose the SMS option and a window appears. In the window, finish filling out the contact information. If you entered a name, provide the phone number, if you entered a phone number then provide a name and click Save. This information will be added to your contacts list for easier reference later. When Gmail gets done saving the contact information, a window appears at the bottom of the screen – much like a chat window. Type you text message and send it with the Enter key. If the other person responds, you will receive a response in the same window. Gmail makes it as easy to send text messages as it is to chat – and best of all it’s free. Another way to send text messages from Gmail is to use the SMS in Chat gadget. This is also a labs feature that works very similar to the Text (SMS) in Chat feature. I don’t recommend using this labs feature. First, it requires the Text (SMS) in Chat feature to be turned on – so why not use that instead? Second, at the time this article was written, the labs feature seems to have a bug in that it prompts you for contact information each time instead of reusing previous entries from the contact database. This creates duplicate entries in the contact database each time you use it. Keep in mind that although the text messaging using Google may be free to you, it may not be free to the person receiving or sending replies. Currently, text messages from chat only work with US phones. While I cannot find a definitive rule or setting to make any particular email address the primary one, my own experience has shown me that mutliple email addresses seem to be ordered by the frequency they are used. The more you use a specific address for a particular person, the more likely that address will appear at the top of the list. If you’ve got information to the contrary, let me know on the blog or drop me an email.